Over the last few weeks we’ve been covering our DIY electric bike. We’ve showed you the overall design and then started to build it. (So if you’re coming to this article first, it won’t make much sense without starting at the beginning! - Building an Electric Bike, Part 1) This week we cover the batteries, controls, and what it’s like to ride. The battery capacity that’s required on an electric bike can be summarised as: the more, the better! Sealed Lead Acid (SLA) batteries are used in most electric-assist bikes and scooters – they’re fairly cheap and are available in lots of sizes. Nickel metal hydride batteries are also used in some designs (as they are in hybrid cars) but they cost more and battery packs normally have to be fabricated from many individual cells. In this case, where lots of hills needed to be negotiated, I went for two 18 amp-hour 12V Sealed Lead Acid designs. They were bought from Jaycar Electronics and they’re cat no SB-2490. They’re yet to go flat on a ride, even on trips of over 20 kilometres across very hilly terrain. If you plan on riding just on the flat, you could probably go for two smaller 12V batteries. The batteries are by far the heaviest elements of the electric system, so if smaller and lighter batteries can be used, that’s a real advantage. It’s best if the batteries are mounted within the wheelbase of the bike. This gives better stability and also allows the frame tubes to be used to securely hold them in place. 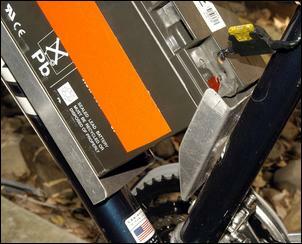 In this case, existing tapped holes in the bicycle frame could be used to mount all but one of the battery supports. A lower battery tray was folded from 1.5mm aluminium sheet and then held in place with bolts passing into the tapped frame holes. The upper mount was secured with a small diameter plastic hose-clamp. Make sure that the batteries are rigidly held in place! 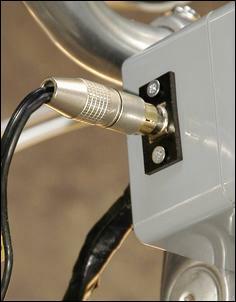 A plastic electronics box is used to mount the two switches on the handlebars. This box was bought new. The switches were salvaged from discarded 240V consumer goods – as I have a whole box of such switches, I can’t be sure where they came from but it’s likely that large old printers were the source. Note that the switches are rated at 10 amps, 240V and are living well in this application, despite a peak current draw of 20 amps. It’s not a requirement, but two extras make riding the bike a lot more interesting and also more fun. The first is a bicycle computer that reads out speed, odometer, trip distance, trip average speed and trip time. (It also reads out calories of rider energy expended but I don’t think that it quite expects an electric motor to be present on the bike!) After a cheap and nasty supermarket bike computer was used and returned, I went for a quality Cateye Velo 8. This is the wiring layout. A 30-amp fuse is placed at each battery to protect against short circuits. A charging socket is also installed. 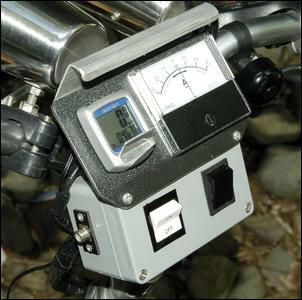 The charging system comprises two nominally 13.5V, 1-amp plugpacks wired in parallel and directly feeding the batteries through a RCA socket installed on the side of the control box. Initially, the charge was through two paralleled 5 ohm, 25-watt resistors. However, I found that connecting the plugpacks directly to the batteries worked much better, without the plugpacks being overloaded or the batteries being overcharged. (For more on using plugpacks in this way, see Zero Cost Trickle Charger). 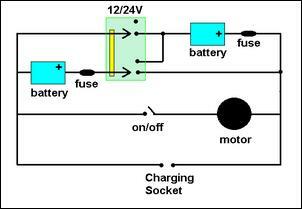 When charging is required, the system is switched to parallel (ie 12V battery voltage) and the charger plugged in. Normally, the bike recovers full battery voltage within 12 hours. 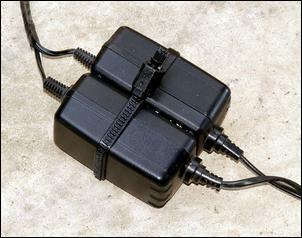 Note that if longer-term standby charging is required, one plugpack can be disconnected. It’s a good idea to tape a couple of spare fuses to the frame. If the roller and tyre are warm (and so grippy!) and you apply 24V by mistake when the bike is barely moving, it’s likely that you’ll blow a fuse. So what’s the bugger like to ride? Firstly it needs to be remembered that the bike is a hybrid human/battery powered design... not a purely electric bike. Let’s take a look at a trip. Then with the bike moving faster, I ratchet up to 3rd gear and select 24V power. The increase in propulsion is immediately noticeable and as I start the climb, I move up to 5th gear. However, the burst of speed is short-lived and as the bike slows with the increasing gradient, I shift back to 3rd, feeling the electrical assist becoming more pronounced. The trick is to match the pedalling speed and selected gear with the amount of electric assist – not going so slowly that the motor is over-loaded, and not pedalling so hard that the rider is over-loaded! I reach the top of the hill and (for this example!) remember I’ve left something at home. Still on 24V I turn and start downwards. Soon the bike speed is increasing – gravity and 24V assisting. However, I realise that I am wasting power – I don’t need to go this fast – and switch back to 12V. The regenerative braking is strong (strong enough that my head dips) and the bike then maintains a slow speed down the hill, the motor (now working as a generator) audibly under load. As the hill flattens before my driveway, the bike slows still further and then when I am only just moving, I switch off the electrics and brake to a halt. The roads on which I am riding are very hilly – too hilly for normal bikes, as people are often seen pushing their bikes up them. However, with electric assist there is not a hill that I cannot ride up, and that is without having to stand and pedal. On a 20 kilometre trip – with barely a few hundred metres of it on flat roads – I can average just under 20 km/h. If you just like the idea of having another form of motorised transport, or your license has gone the way of the dodo, an electric-assist bike is a do-able do-it-yourself project. It’s also a helluva lot of fun! Logging of motor current was carried out using a current clamp and a Fluke Scopemeter. Current values above zero show the motor under load – the peak current draw is 20 amps, which occurs when climbing a steep hill. 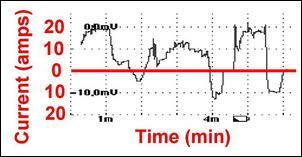 Current draws below zero show regenerative braking – the maximum regen current flow shown here is about 11 amps. The average current draw for the 6 minute ride was 8 amps. 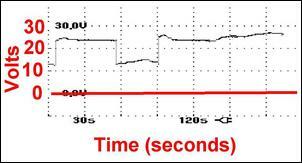 This graph shows the logged motor voltage during a short ride. The bike is started in 12V mode before it is switched to 24V (at 5 seconds into the ride). The voltage momentarily rises to 25V before falling back to a steady 24V as the motor helps propel the bike up the steep hill. At the top of the hill the bike performs a U-turn, being switched back to 12V mode for regen braking (50 – 90 seconds). The voltage rises slightly during the regen before the voltage is again switched back to 24V for more propulsion. From 140 – 180 seconds some regen is occurring in 24V mode, the bike being braked down this hill by the motor/generator and the voltage rising to 27V.